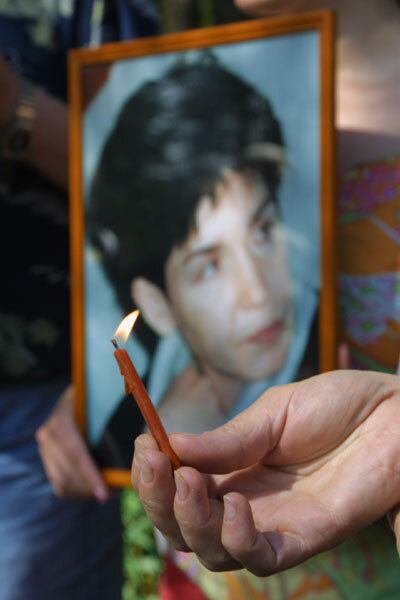 "People Never Lie As Often As Before an Election"
The government of Belarus has failed to properly investigate the murder of Veronika Cherkasova, a well-known opposition journalist, stabbed in Minsk on October 20, 2004. Despite all the evidence suggesting Veronika was assassinated because of her professional activity, the authorities preferred to cynically and cruelly harass her family by naming her son, Anton Filimonov, and elderly stepfather, Vladimir Meleshko, suspects in their "investigation." The investigators focused their efforts on pinning the crime on the 15-year-old Anton. Unable to build a credible case against the teenager, the authorities arrested him on charges of money forgery. In detention Anton was being pressured to "confess" to the murder of his mother. Veronika's case is not an isolated incident. The authoritarian regime of president Lukashenko has also failed to investigate the murder of another opposition reporter, Vasily Grodnikov, as well as disappearances of prominent opposition figures and journalists, including Anatoly Krasovki, Yuri Zakharenko, Viktor Gonchar and Dmitry Zavadsky, despite credible reports that senior government officials were involved. More information on the website of the Civil Initiative "We Remember"
MINSK -- The chief investigator of the Minsk Prosecutor's Office, Sergey Ivanov, said in an interview with the newspaper "Zvyazda" ("Star") that even though the investigation into Veronika Cherkasova's murder had been suspended due to inability to identify the perpetrators, the operative work on the case continues. "In my opinion, this case isn't hopeless, and its investigation can be brought to a logical end," he said. Ivanov alleged that the murder was not a carefully planned or premeditated one, because "the killer used a knife that he found in his victim's kitchen. Had the perpetrator originally intended to murder Cherkasova, he would have brought his own weapon instead of relying on an accidentally found knife." BELARUS ranked 151 on RSF's Worldwide Press Freedom Index 2006 - securing a spot between Yemen and Libya. BRUSSELS -- The International Federation of Journalists (IFJ) and the Belarusian Association of Journalists (BAJ) launch a special appeal to the authorities to re-open the investigation into the murder of investigative journalist Vieranika Charkasava. GENEVA (AP)--The human rights situation in Belarus has deteriorated steadily in the past two years, a U.N.-appointed rights expert said Tuesday, calling the detention and mistreatment of opposition activists and journalists a particular concern. In his report to the U.N. Human Rights Council, the global body's top rights watchdog, Adrian Severin urged Belarus' government to put an end to the arrests, beatings and expulsions by police forces that have drawn a barrage of criticism from the international community in recent years. Veronika Cherkasova (Belarusian: Веранiка Чаркасава; Russian: Вероника Черкасова; Alternative spellings: Vieranika Charkasava, Wieranika Tscharkassava) - a Belarusian opposition journalist, brutally murdered in her apartment in Minsk on October 20, 2004. Her body was discovered with over 40 stab wounds, most of them around the neck, and a knife blade stuck in her chest. The killer did not take any money or valuables but left a trace of blood in her address book. Her last job was with an independent newspaper Salidarnasc. She had worked and written for a variety of Belarusian and Russian periodicals, often taking a sharply critical stance on the totalitarian regime in Belarus, and especially, the Belarusian president Aleksandr Lukashenko. Veronika had published a number of articles in Russian press that were sharply critical of the president (such as A Dandy President and Reporter on a Leash) and might have been perceived by Lukashenko as "defamation". On October 17, 2004, a referendum was conducted by Lukashenko to override constitutional term limits for his presidency. Independent observers and media reported that Lukashenko achieved his victory by fraudulent means. International organiszations and governments around the world issued protests, calling on Lukashenko, among other things, to stop the persecution of independent media and demanding an investigation of disappearance of opposition reporters and political activists. Veronica's murder coincided with these events. Eventually, 6 months after the murder, Anton and Vladimir's suspect status was lifted. At the end of December 2005 the Prosecutor General's office closed Veronika's case "due to the absence of indictable suspects." A few days later Anton was arrested along with several teenagers on money forgery charges. While other boys were released almost immediately, Anton was placed into a preliminary investigation jail where he has once again been pressured to admit to the murder of his mother. On April 11, 2006, Anton was convicted and sentenced to 2,5 years of prison. Because of his age, the jail term is deferred by 2 years. His "accomplices" received similar convictions with 2 years in jail. Remarkably, Anton's neighbor, whose computer equipment was used for the alleged forgery, appeared in the case only as a witness. Anton's family described him as an instigator and, possibly, a provocateur in what might have been a set-up. The findings of journalists' research have been quietly ignored by the official investigators. Although the case was closed on April 11, they failed to inform Veronika's relatives and colleagues of this decision until over a month later.